The new name for Hunter Chase Evening - Race Night! The only evening fixture at Cheltenham Racecourse gives amateur riders and trainers their chance to shine on the stage of dreams here at the Home of Jump racing. The 2018 rendition of the fixture saw Barel Of Laughs secure back-to-back victories at this meeting. Kick start your Bank Holiday weekend and make the most of the after party in The Centaur after racing - keep your eyes peeled for music acts to be announced. Last year BBC Radio 2's Jo Whiley and Radio 1's Huw Stephens took to the stage and entertained racegoers into the evening. Come along for a fantastic day of racing, with bars and restaurants open to suit all tastes throughout the day. More on-the-day raceday information will be released in due course. As Cheltenham's most exclusive area, the Club Enclosure provides a range of viewing and refreshment options. Guests will be treated to spectacular views from the main grandstand, viewing steps and lawn, whilst the center of the course (by the final fence) can also easily be reached. Guests will also have access to all facilities included in the Tattersalls Enclosure. The Tattersalls Enclosure offers guests extensive views from the Grandstands viewing steps. Badge holders have access to the Paddock, Winner's Enclosure viewing steps, The Hall of Fame and The Centaur. The bookmakers in the betting ring (weather permitting) and the extensive totepool betting facilities can also be easily reached. Finally, the enclosure contains a host of bars and eating options including the Gold Cup and Festival Restaurants and the trade stands in the Tented Village. Cheltenham’s Best Mate enclosure is situated directly opposite the main grandstand and provides great views of the racing. Built in 2004, this modern grandstand offers a variety of food choices, as well as extensive betting facilities and bars. Access to the Parade Ring or additional activities and entertainment such as the Shopping Village is not available from Best Mate. Available on all racedays apart from the Bet Victor Gold Cup Day and Cheltenham Festival Week when the enclosures are separated. Guests can enjoy all the Club and Tattersalls enclosures (listed above) have to offer. This includes access to the Members Lawn, viewing steps, Paddock and the centre of the course by the final fence (weather permitting). Cheltenham Spa is easily accessible from both London’s Paddington and Luton with trains running hourly and a journey time of approximately 2 hours. From Birmingham, the journey will take approximately 35 minutes with trains every 30 minutes. From Bristol, trains take about 35 minutes and leave every hour. Taxis from the station will take 10 minutes, whilst a walking route will take approximately 40 minutes and is easily signposted. During Cheltenham festival a bus will be picking up from Cheltenham Spa station and WH Smith in the Town Centre and dropping off at the racecourse. Return buses from the racecourse, will stop at Pittville Street before dropping off at the station. Returns and Singles from the station cost £5 and £3 respectively, whilst singles from the town and racecourse costs £2.50 each. Birmingham and Bristol airports have international flights passing through daily and are easily accessible to/from the course. Meanwhile, Gloucestershire airport is able to schedule private flights. A helipad is also available at the airport. Parking at Cheltenham is free on all days apart from the Festival and Saturday of the Open. Parking for the festival is £15 on the day and £8 in advance, whilst parking for the Saturday of the Open is £5 on the day and £4 in advance. 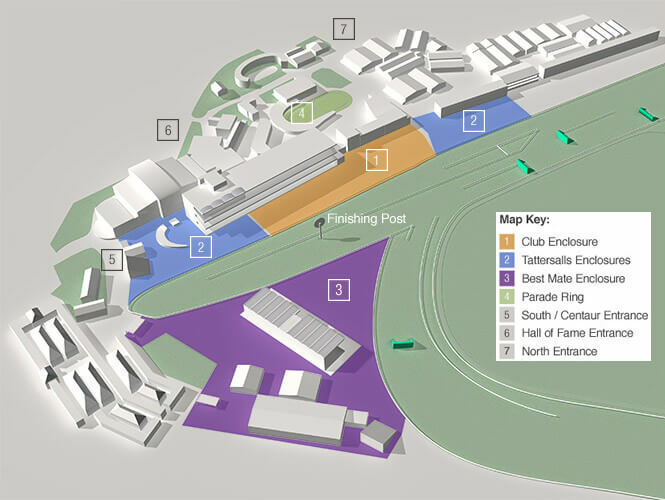 The parking scheme for Cheltenham can be found here http://cheltenham.thejockeyclub.co.uk/plan-your-race-day/visitor-information/directions-parking.The scheme is colour coded so that your parking zone will match your label and preferred route. When picking up and dropping off during the Open and Cheltenham Festival please use the green area at West Car Park. From there, it is a 5 minute walk to the entrances. There is no particular dress code at Cheltenham, as racing occurs mostly during the Winter months. Racegoers are asked to take both the occasion and weather into account when deciding what to wear. Gentleman will usually wear a suit or similar when in the Club Enclosure, restaurants and hospitality facilities. During the Festival, many ladies wear hats, but with the weather rather than high fashion in mind. Fancy dress is allowed as long as not deemed offensive, and the club reserves the right to turn anyone away who they believe to be dressed inappropriately. As the Home of Jump racing, there are few sporting venues able to match a prestige such as Cheltenham’s. With 16 enthralling days of top class racing each year and an extensive history, this is the place where Champions are born. Indeed, the best of the best compete in a series of championship races over jumps, and sell out crowds of up to 70,000 pack the racecourse amphitheatre that nestles under Cleeve Hill. The racecourse also plays host to the creme de la creme of, not only racing at Cheltenham, but the whole jump season in its entirety. Taking place over four days in March, Cheltenham Festival attracts racegoers from far and wide, all helping to create a special atmosphere made up of a 260,000 audience and the best horses, jockeys and trainers worldwide. Comprising of the Gold Cup, Queen Mother Champion Chase and Champion Hurdle, Cheltenham Festival may well be as close to heaven on earth as possible for real racing fans, whilst the craic contributed by the Irish contingent is always engaging. The final day of the Festival is always the highlight of the week, with the cream of national hunt racehorses taking part in the Blue Riband event – the Timico Cheltenham Gold Cup. While for many the 2011 victory of Long Run from past winners Denman, Kauto Star and Imperial Commander will live long in the memory, others will never forget Desert Orchid staying on dourly up the hill to record a famous success in 1989. Fortunately, the course holds other events outside those marvellous four days in March, with the Bet Victor Gold Cup meeting in November and Trials Day in January filling the Festival void.